If you like the Mona Lisa and you like breakfast, why not combine the two? 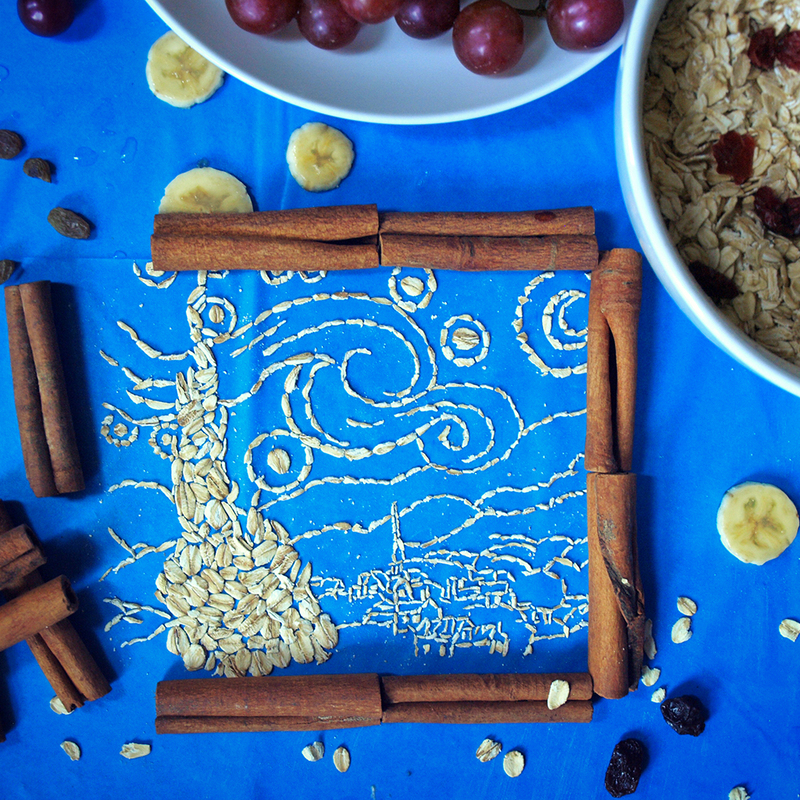 In this bizarrely entertaining series of photographs, food artist Sarah Rosado recreates some of the most famous paintings of all time out of oat flakes and cinnamon. Pictured with delicious oatmeal flavor combinations, these works of art could be as nourishing for your appetite in the morning as their inspirations are for the soul. There's an oat flake work of art for pretty much any art fan ever here. Whether you like to keep it super traditional, with an oat rendition of Michelangelo's The Creation of Adam or Leonardo da Vinci's Mona Lisa, or you'd rather jump to the twentieth century with oat-ful recreations of René Magritte's Son of Man or Gustav Klimt's The Kiss, you're going to find one of your favorites in Rosado's work. And not only can you find your favorite painting: you can also find your favorite oatmeal flavor combination. Whether you like it with mixed berries, apple and golden raisins, blueberry and almonds, or banana slices and craisins, there's going to be some oatmeal combo here that will speak to you. As long as you like cinnamon: all the paintings sit in cinnamon stick picture frames. If Rosado's work looks a little familiar, it's very possible that you've seen it before. In the past, she's made images out of corn flakes, Fruity Pebbles, and pieces of fruit. Aside from her gorgeous works of art made from chocolate shavings, breakfast art is kind of Rosado's thing. For more, you can follow Sarah Rosado on Instagram and Snapchat.